New flooring is a great way to redefine the look and feel of your favorite spaces. At My Flooring America, we are committed to helping homeowners get the most out of their investments. To that end, we are proud retailers for CORETec Flooring in Webster, TX. Explore your interior design options, while making your home a more practical space. We’re with you at every phase of your remodeling project. Get the materials, resources, and support you need to generate lasting results. Our showroom offers an extensive selection of CORETec luxury vinyl planks--and more. When you visit our location, you can view samples of many different flooring products, empowering you to mix, match, and order the right flooring from the first visit. Everyday Durability: CORETec flooring is comprised of tough, heavy-duty materials that make it waterproof, spill proof, kid proof, and pet proof. Stains won’t stay long on this flooring, as they wipe away easily with a mild cleaning solution and cloth. Safe and Sanitary: Thanks to this flooring’s waterproof construction and non-porous surface, liquids and spills won’t have a place to settle on this flooring. As a result, this product line is highly resistant to mold and mildew growth, protecting your family. Insulation Properties: This flooring is soft where it counts, allowing it to be used in virtually any room. Also, it absorbs sound waves to soften your home’s overall acoustics, while retaining heat during the chillier months, so you’ll save money on your heating bills. 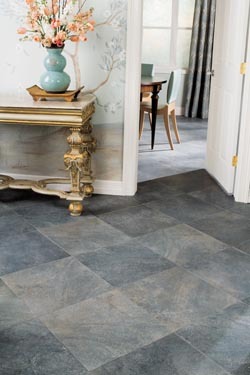 As part of our extensive luxury vinyl flooring collection, CORETec offers a wealth of options for your next project. Our catalog includes both CORETec luxury vinyl tiles, and also CORETec luxury vinyl planks. Now, you can give any room the aesthetic you want with the strength your home needs. CORETec tiles are available in a variety of shapes and sizes, each in a wide selection of colors and patterns. Likewise, you can also find our luxury vinyl tile options in the appearance and texture of premium materials like stone and ceramic. Mix and match to create unique patterns that only your home can have. We also carry a staggering selection of CORETec planks. Thanks to their innovative design and manufacturing process, these luxury vinyl options are available in the appearance of solid hardwood flooring. Now, your property can have natural beauty in every room--including the basement. Not sure which to choose? There’s no need to worry, as we are here to provide top-notch assistance. The members of our showroom staff are well-versed in the latest trends sweeping the flooring and interior design industries. We’ll consult with you, consolidate your project goals, and make the right recommendations that fit your needs. On top of that, we can coordinate CORETec flooring installation services according to your schedule. Hands down, we make remodeling a simple and stress-free experience. Contact us to request a consultation for CORETec flooring. We proudly serve property owners throughout Webster, TX, including Clear Lake, Houston, Nassau Bay, Sea Brook, and the surrounding area.